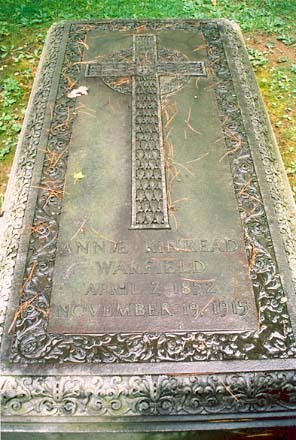 When gathered all together, not much is really known about Annie Pearce Kinkead Warfield, wife of Dr. Benjamin B. Warfield. Our post today is drawn from a longer biographical article written for the PCA Historical Center by Barry Waugh. Beloved Wife of a Scholar. Benjamin pursued his theological education in preparation for the ministry by entering Princeton Theological Seminary in September of 1873. He was licensed to preach the gospel by Ebenezer Presbytery on May 8, 1875. Following licensure, he tested his ministerial abilities by supplying the Concord Presbyterian Church in Kentucky from June through August of 1875. After he received his divinity degree in 1876, he supplied the First Presbyterian Church of Dayton, Ohio, and while he was in Dayton, he married Annie Pearce Kinkead, the daughter of a prominent attorney, on August 3, 1876. Soon after he married Annie, the couple set sail on an extended study trip in Europe for the winter of 1876-1877. It was sometime during this voyage that the newly weds went through a great storm and Annie suffered an injury that debilitated her for the rest of her life; the biographers differ as to whether the injury was emotional, physical, or a combination of the two. Sometime during 1877, according to Ethelbert Warfield, Benjamin was offered the opportunity to teach Old Testament at Western Seminary, but he turned the position down because he had turned his study emphasis to the New Testament despite his early aversion to Greek (vii). In November 1877, he began his supply ministry at the First Presbyterian Church of Baltimore, where he continued until the following March. He returned to Kentucky and was ordained as an evangelist by Ebenezer Presbytery on April 26, 1879. In September of 1878, Benjamin began his career as a theological educator when he became an instructor in New Testament Literature and Exegesis at Western Theological Seminary in Pittsburgh. Western Seminary had been formed by the merger of existing seminaries including Danville Seminary, which R. J. Breckinridge, Benjamin’s grandfather, had been involved in founding. The following year he was made professor of the same subject and he continued in that position until 1887. In his inaugural address for Professor of New Testament Exegesis and Literature, April 20, 1880, he set the theme for many of his writing efforts in the succeeding years by defending historic Christianity. The purpose of his lecture was to answer the question, “Is the Church Doctrine of the Plenary Inspiration of the New Testament Endangered by the Assured Results of Modern Biblical Criticism.” Professor Warfield affirmed the inspiration, authority and reliability of God’s Word in opposition to the critics of his era. He quickly established his academic reputation for thoroughness and defense of the Bible. Many heard of his academic acumen and his scholarship was awarded by eastern academia when his alma mater, the College of New Jersey, awarded him an honorary D. D. in 1880. According to Samuel Craig, Dr. Warfield was offered the Chair of Theology at the Theological Seminary of the Northwest in Chicago in 1881, but he did not end his service at Western until he went to teach at Princeton Theological Seminary beginning the fall semester of 1887. He succeeded Archibald Alexander Hodge as the Charles Hodge Professor of Didactic and Polemic Theology. His inaugural address, delivered May 8, 1888, was titled “The Idea of Systematic Theology Considered as a Science.” As he taught theology, he did so using Hodge’s Systematic Theology and continued the Hodge tradition. The constant care Annie required and the duties associated with teaching at Princeton, resulted in a limited involvement in presbytery, synod, and general assembly. Annie lived a homebound life limiting herself primarily to the Princeton campus where Benjamin was never-too-far from home. The Warfields lived in the same campus home where Charles and Archibald Alexander Hodge lived during their years at Princeton. Pictured at right: Commemorative plaque placed in Miller Chapel at Princeton Seminary in honor of B.B. Warfield. Photo by Dr. Barry Waugh. Benjamin enjoyed a busy schedule at Princeton. One of his duties at Princeton included editing the Presbyterian Review, succeeding Francis L. Patton. When the Presbyterian Review was discontinued, he planned and produced the Presbyterian and Reformed Review until the Faculty of Princeton renamed it the Princeton Theological Review in 1902. During his Princeton years he was awarded several times with honorary degrees in addition to his D.D. including: the LL.D. by the College of New Jersey in 1892, the LL.D. by Davidson College in 1892, the Litt.D. by Lafayette College in 1911, and the S.T.D. by the University of Utrecht in 1913. After thirty-nine years of marriage, Annie died November 19, 1915. She was buried in the Princeton cemetery of what is now the Nassau Street Presbyterian Church with a bronze, vault sized ground plate marking her location. Benjamin continued to teach at Princeton until he was taken ill suddenly on Christmas Eve of 1920. Until this illness, Dr. Warfield had followed an active and busy teaching schedule into his seventieth year of life. His condition was serious for a time, but he improved enough that he resumed partial teaching responsibilities on February 16, 1921. Despite not feeling ill effects from the class he taught that day, he died of coronary problems later that evening. He was buried next to his beloved Annie with a similar marker for his grave. The Warfields did not have any children. Does the reality of your life live up to the words of your Christian testimony? The life-long love expressed by Dr. Warfield for his wife, no doubt sacrificial at times, stands as a vibrant witness to his faith in the Lord Jesus Christ. Christ calls us to live not for our own sake, or for our own comfort or advancement in this world. Rather, He calls us to live for His glory, and living that life in keeping with His Word may well mean great sacrifice of one sort or another. Through it all, God calls us to remain faithful, relying upon Him at every turn, and by His Spirit overcoming every adversity, all to His glory. But the whole affair was taxing and Rev. Brown died at the young age of 35. His successor, the Rev. Daniel Dana, lasted just one year before he too was worn out and resigned the post. Bennet Tyler and Nathan Lord, the next two presidents, faired better. While Tyler served just four years, Nathan Lord’s term as president ran from 1828 to 1863. His term might have run longer, but as events unfolded in the 1860’s, the Trustees of Dartmouth were forced to finally deal with the fact that the school’s president was a strong pro-slavery advocate. So it was that in 1863, the Rev. Asa Dodge Smith became the seventh president of Dartmouth College. Inaugurated on this day, November 18, in 1863, he served as president until his death on August 16, 1877, at the age of 73. 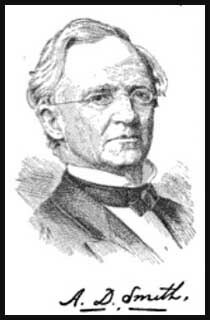 Asa Dodge Smith was born in Amherst, Massachusetts on September 21, 1804, the son of Dr. Roger and Sally (Hodge) Smith. He was himself a graduate of Dartmouth College (1830), and in the year or so following graduation he worked as the principal of an academy in Limerick, Maine. Preparing to enter the ministry, he studied at Andover Theological Seminary and graduated there in 1834. He was then ordained and installed as pastor of what was then the Brainerd Presbyterian church (later renamed as the 14th Street Presbyterian church) in New York City. Rev. Smith also served as a professor of pastoral theology at the Union Theological Seminary, NY, 1843-1844. “After the forced resignation of Nathan Lord in 1863 over his support for slavery, the Trustees wanted a more conservative president to take his place. As a preacher for 29 years at the 14th Street Presbyterian Church in New York City, Asa Dodge had developed a reputation as a religious man with abolitionist beliefs. Some of the honors conferred on the Rev. Asa Dodge Smith during his lifetime included the Doctor of Divinity degree, awarded by Williams College in 1849, and from the University of New York he received the Doctor of Letters degree in 1854. It was also during his tenure that the school celebrated its centennial anniversary, a momentous time nearly ruined by an unexpected thunderstorm. But ultimately the affair was not ruined for the participants, with attendees including Supreme Court Justice Salmon P. Chase, from the Class of 1826, and U.S. General William Tecumseh Sherman. Perhaps covenant faithfulness is the lesson to take away from this account. A life lived apparently without amazing exploits or heart-rending stories, but lived faithfully before the Lord, using his God-given gifts and talents to the best of his ability, and all for the glory of God. So too most Christians live fairly average lives, undistinguished except for this one vital thing: Because of the finished cross-work of Jesus Christ, each one of His blood-bought children stands in a living, vital relationship with the God of creation, the Lord of all glory. On the surface, our lives may seem quite average, but the reality is far more exciting, far more glorious than even we can imagine. Our famous person today is James McKinney. Besides being described as our title puts it, he was the founder, under God, of the Reformed Presbyterian Church in the United States, as Rev. Carlisle puts it in an article, The Life and Times of Rev. James McKinney. Certainly, both Rev. Glasgow and Rev. William Sprague testify that for scholarship and eloquence, he was not only the greatest man in the Covenanter church, but also he was a great man among men of that age. All of these accolades should cause us to want to know more about this servant of God. Born on this day, November 16, 1759 in County Tyrone, Ireland, the son of Robert McKinney, James studied in the preparatory schools of his upbringing. Entering the University of Glasgow, Scotland, he spent four years before graduating in 1778. He stayed on in the area to study both theology and medicine. Licensed by the Reformed Presbytery of Ireland in 1783, and ordained by the same church court, he was installed in two congregations in County Antrim, Ireland. One year later, he married Mary Mitchell, from which union came five children. He was faithful in administering the Word and Sacraments for ten years in these two Irish congregations. Known as a bold and fearless advocate of the rights of God and man, a sermon on the “Rights of God” made him a marked man by the British government. Indicted for treason by the latter, he escaped to America in 1793, with his family joining him later. From Vermont to the Carolinas, he ministered to Irish societies tirelessly, forming some of them into congregations. In 1797, his family joined him in the new land. In 1798, in a new location in Philadelphia, he organized, with Rev. Gibson, the Reformed Presbyterian Church of America. He himself took charge of two congregations, one of which was Duanesburgh, New York. His broader ministry took him to other locations, as he and another minister visited the southern areas of this new land, to, and this is interesting, to seek to convince the churches of the land to abolish slavery from their thinking and actions. In 1802, he resigned his pulpit at Duanesburgh, New York to accept the call of Rocky Creek, South Carolina. Soon after that, however, he died on September 16th, 1802. November 14: New School Synod Minutes! 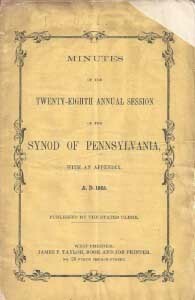 During the course of your web-surfing or reading about Presbyterian history you may have run across the terms, “Old School” and “New School,” or their abbreviations, “OS” and “NS.” Before getting to the purpose of this post, which is the PDF download of the minutes of the Synod of Pennsylvania, New School, a brief explanation of the terms “New School” and “Old School” may be beneficial. Old School—Generally speaking, the Old School believed—in a stricter or fuller subscription to the Westminster Confession of Faith and its associated standards; that the issue of slavery was a political and not a church issue; that missionary work should be under the direct oversight of the Presbyterian Church and not through independent mission organizations; and that the Plan of Union of 1801 affiliating the Presbyterian Church in the United States of America (PCUSA) and the Congregational Church had been detrimental to the Presbyterians because of some of the theological views and practices from New England. These are not all the points of disagreement but they cover most of the issues. It could be said that the Old School believed—the church should be directly ruled in all its ministries by elders connectionally associated through its sessions, presbyteries, synods, and general assembly, with its interpretation of the Word of God governed by a conservative use of the Westminster Standards, and it believed that the church’s ministry is exclusively spiritual and not political. Thus, the Old School had a strong sense of the Word’s warrant for presbyterian government as the church government and it held to the necessity of confessional standards for proper interpretation of the Bible and governing the church rightly in its spiritual ministry. New School—Generally speaking, the New School believed that—a considerably lesser adherence to the Westminster Confession of Faith and its associated standards was acceptable, even necessary; the issue of slavery was within the bounds of the spiritual ministry of the church and many believed that immediate abolition was the best solution; the use of what might be called today interdenominational mission organizations was beneficial and more efficient for missionary work and church extension than committees overseen directly by the presbyters; the Plan of Union had not only benefitted the Congregationalists and the Presbyterians, particularly in terms of the growth of both denominations in the western frontier (i.e. New York, Ohio, etc. ), but the New England theology influenced the PCUSA to be less rigorous and more open to differing doctrinal ideas. The New School views could be summarized—the Presbyterian Church is governed by elders locally and connectionally but other polities, including congregational, are scriptural as well; the Presbyterians should participate in missionary organizations that are not under direct control of the denomination for more efficient evangelism; the interpretation of the Word of God by the Westminster Confession is of lesser or no importance for church doctrine and practice; and the church’s ministry is spiritual, but the spiritual work does not exclude political activism for what the church sees as pervasive sins in society. Thus, the New School had a lesser sense of the uniqueness of presbyterian church government and a more inclusive idea of denominational ministry; a liberal, or nonexistent, adherence to the confessional standards for doctrine; and an expanded idea of what the spiritual ministry of the church looks like. If you have never read anything about the Old School and the New School you are probably thinking that the two could not continue to exist together because it was a disaster from day one. You would be correct. The point for the beginning of trouble was seen by the Old School to be 1801 when the Plan of Union was accomplished. There were those who opposed the Plan of Union, but their appeals were not heeded. As the years passed, the members of the respective schools found their points of difference more polarizing, especially as the issue of slavery sectionalized both the nation and the churches. At the 1837 General Assembly of the PCUSA, the Old School had the majority and was able to undo some of the affects of the Plan of Union, the plan itself, and eject the New School. Obviously, it was not a happy situation following the 1837 General Assembly. The press, both private and religious, reported some of the unseemly moments on the floor of the assembly as commissioners railed and argued. Following the division, both sides claimed to be the true PCUSA. When the Synod of Pennsylvania, New School, convened in the evening of Tuesday, October 17, 1865, in the Third Presbyterian Church, Philadelphia, the retiring moderator, B. B. Hotchkin, the pastor of the Marple Church, passed the gavel to Rev. Thomas J. Shepherd of First Church in the Northern Liberties, Philadelphia. The meeting was particularly significant because it was the first annual meeting following the Civil War, the assassination of President Lincoln, and the inauguration of Vice President Andrew Johnson to the presidency. Since the previous synod meeting there were many things that had changed. For the New School, one of, if not the key issue for its identity, abolition of slavery, had been achieved. There was some optimism in the land about the future, especially if one lived north of the Mason-Dixon Line, but the optimism was tenuously mixed with different ideas about how the post-war situation with the Southern states should be handled. In the North, many adamantly contended that the former Confederacy should pay a heavy price, but on the other end were others desiring to see all the states working together as a reunified nation. In the South, there were many fearing retribution, wondering if they would have food, and apprehensive of finding work in the devastated economy, however, there were also numerous others consumed with anger against the North. Between the two poles of ideas in both North and South were a myriad of other perspectives. The tension in the nation carried over into the meeting of the synod. The presbyters tended towards the heavy-price-to-be-paid view regarding the South’s future. The synod was meeting just a few months after the North and South had ceased killing each other and there was much mourning, ire, and bitterness. A series of six resolutions regarding “the State of the Country” were passed unanimously with a seventh added later, which was also passed unanimously. On the final day of the sessions as the business was coming to an end, a resolution was adopted regarding the health of Rev. Albert Barnes, who was a key figure of the New School and had been tried for heresy with the impetus provided by the Old School. Other resolutions regarding the usual house cleaning at the end of a synod were accomplished including the resolution of thanks to the host church. The synod adjourned to meet in the First Church, Carlisle, October 16, 1866, per the minute taking of Stated Clerk William E. Moore. Please, download the free PDF of these minutes at the link below. The digital minutes were scanned from a copy owned by the author of this site. The minutes have an appendix that includes the synod’s standing rules; a directory of the presbyteries, churches, ministers, and elders; and there is a list of synod and presbytery officers. When He Died, The Town Shut Down. John Todd Edgar, D. D., was born in Sussex county, Delaware, April 13th, 1792. His father removed to Kentucky in 1795. He was at the Transyl­vania University, Lexington, Kentucky, a short time, but was not a graduate. He graduated at Princeton Theological Seminary in 1816 [as Princeton Seminary was established in 1812, the school had only graduated its first class the year before, in 1815.] He was thereafter licensed to preach by the Presbytery of New Brunswick. Upon his ordination in 1817, he was installed as pastor of the Church at Flemingsburg, Kentucky, and la­bored there with earnestness and assiduity. He was subsequently pastor at Maysville, Kentucky, and in 1827 took charge of the Church at Frankfort, the capital of Kentucky. Here his eloquence soon gathered round him the leading men of the State. In 1833 he accepted a call from a church in Nashville, Tennessee, and it was among this congregation that his great life-work was fully accomplished. A new facility was completed for the congregation in the year of his arrival, and the same building was destroyed by fire in September of 1848. The property was valued at $30,000 to $40,000, though only insured to the amount of $8,000. Dr. Edgar died of a stroke, which was in that era called apoplexy, on November 13th, 1860, at the age of 68 years and 7 months. His death produced such a profound sensation in the community, that, by proclamation of the Mayor, there was a general suspension of business in the city, and the Chancery Court, then in session, adjourned. Dr. Edgar was a cultivated and courteous gentle­man. His intellectual endowments were more remarkable for their admirable balance than for the special eminence of particular faculties. He was accounted one of the finest orators of his day. As a pastor, he was social, winning and a friend to all. His temperament was kind and genial, generous, loving and most just. He had a settled aversion to all that was mean, cruel and base, and was himself sustained by personal and moral firmness of the highest order, and was thor­oughly unselfish. By birth, training and deep con­viction he was a Presbyterian, and clear and constant in his convictions, kind and trustful towards all good men of every denomination, he was a noble specimen of the body to which he belonged. Freely edited from Nevin’s Encyclopedia of the Presbyterian Church, p. 208, with additional information drawn from The First Presbyterian Church of Nashville: A Documentary History. November 12: Two Assemblies in One Year! 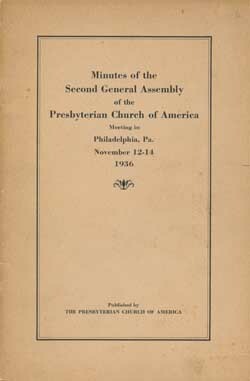 With over four hundred attendees, the Second General Assembly of the Presbyterian Church of America met in the large auditorium of the Manufacturers’ and Bankers’ Club in Philadelphia, Pennsylvania, beginning on Thursday,November 12, 1936. Present were 64 teaching elders and 26 ruling elders, with numerous guests. The photograph below serves to document that occasion. To my knowledge, no photograph has been discovered of their first General Assembly, which met in June of 1936. The first Moderator of the new denomination, J. Gresham Machen, preached from2 Corinthians 5:14, 15. The text reads, “for the love of Christ constraineth us; because we thus judge, that if one died for all, then were all dead: And that he died for all, that they which live should not henceforth live unto themselves, but unto him which died for them, and rose again.” Speaking on the love of Christ being a constraining force, Dr. Machen, in a message not soon forgotten by those who heard him, stated that Christians should not live to themselves but live unto Christ. Taking the position of Moderator was the Rev. J. Oliver Buswell, D.D., president of Wheaton College, Wheaton, Illinois. He was to moderate the meeting in good fashion as a moderator should do, without fear of discipline or the ridicule of biblical positions. This General Assembly adopted the Westminster Confession of Faith and Catechisms as they stood before the 1903 additions enacted by the P.C.U.S.A. general assemblies. Thus the Presbyterian Church of America put itself on record as being a truly Reformed church. Various reports came on this day and over the next two days, from committees set up by the previous Assembly in June of 1936. These included Home Missions and Church Extension, with report of 13 home missionaries already at work in the field. Present among them was one home missionary to South Dakota, the Rev. David K. Myers, this writer’s father. The Committee on Foreign Missions also reported, encouraging support for the Independent Board for Presbyterian Foreign Missions. However, it also spoke about the establishment of an official Board of Foreign Missions from the denomination at the next General Assembly. Also on this day, November 12, in 1886, Archibald Alexander Hodge died in Princeton, New Jersey. Words to live by: This writer can read the minutes of the Second General Assembly, as he has a copy of them before him, but the spirit of the meeting was only to be enjoyed by those who were actually present. 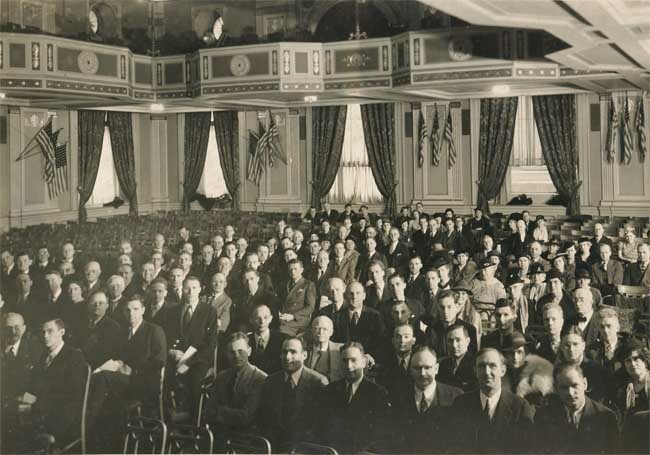 It must have been a joyous meeting to realize that since just that previous June of 1936, the number of ministers had increased from 35 pastors to 107 ministers in the Presbyterian Church of America. God was doing a great work in this spiritual successor to the Presbyterian Church, U.S.A. Take time to look at your church choice, and if it is an Evangelical and Reformed Church, rejoice in what is happening in it as a sign of God’s blessings. Indeed, support it with your tithes and offerings. It probably is not perfect. No church this side of glory is perfect. But if it is committed to the Scriptures, the Reformed faith, and the Great Commission, then give thanks for it, pray for it, and support it. In his young years in Scotland, his classmates called him “preacher McIntyre.” That was because his early years were subject to serious impressions. Growing up, he became an apprentice to a shoemaker in Glasgow, Scotland. This “job” was followed by the task of shepherding sheep in the Highlands of the country. John McIntyre would never forget the spiritual lessons of that calling, even many years later. At the age of twenty years, he made a public confession of faith in Jesus Christ as Lord and Savior. It was said that his faith was tested by trying circumstances. One such example of those circumstances was, after his marriage, he emigrated to North Carolina. On the long ocean voyage, they buried overboard their first born child. In fact, unnamed domestic affliction and trouble rolled over the couple greatly, until they moved to South Carolina. In attending camp meetings of the Great Revival, for a while he doubted his conversion. But God was at work in his life and he was able to recover his hope of eternal life. Pressing on in his spiritual life, he began to desire serving the Lord as an ordained minister. He was now in his early fifties, and friends opposed his desire. After all, he was not in his twenties. He had only a limited education. But John persisted in a laborious study and application of the requisite courses of theology. As a result, he was licensed to preach on September 25, 1807. 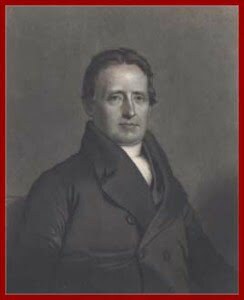 For the next thirty years, he supplied pulpits at Presbyterian congregations – in Philadelphia, Bethel, Lumber Ridge, and at St. Paul. His death took place on this day, November 11, 1852, at the age of one hundred and three years of age! It was said that he was per-eminently devout, prayerful, vigilant of the interests and welfare of the church, was ready for every emergency, and shrank from no duty of religion. About the only thing he questioned was why God should delay so long to call him home! Scripture reminds us in Romans 12, 1 Corinthians 12, and Ephesians 4, that every believer has at least one spiritual gift. We are to speak or serve our God with that spiritual gift. See 1 Peter 4: 10, 11. Have you discovered your spiritual gift yet? And are you developing it by education and experience? Have you dedicated it to the Lord of the church? And are you doing it, to God’s glory and the benefit of the church to which you belong? “Preacher McIntyre” discovered his gift late in his life, and despite the doubt of many of his church friends, developed it, dedicated it to the Lord Jesus, and did it to God’s glory and the good of the church.